Such was the case today. The kids got their $3.00 coupons for their birthdays from Toys R Us, so we went out tonight to pick out a toy. Pokey had to get an advance on her allowance (since she lost her $10 in her purse) and Little Man had just finished detailing the interior of the car (for his $2.50). He had a grand total of $15.00 (including his $3.00 coupon). After almost an hour of trying to decide what to spend their money on Pokey got a Littlest Pet Shop and Little Man a Webkinz. Now to my point. While I was there I decided to buy them some hula hoops. They were on sale. We stopped at the school on the way home to try them out. Pokey loved it and was good right away and Little Man really never took to it. Pokey ended up with both of them. Maybe it's a physical limitation boys have? It does require a little skill to be able to move those hips like that, but Little Man really didn't give it much of a chance. At least one of them enjoyed it. oh what fun. 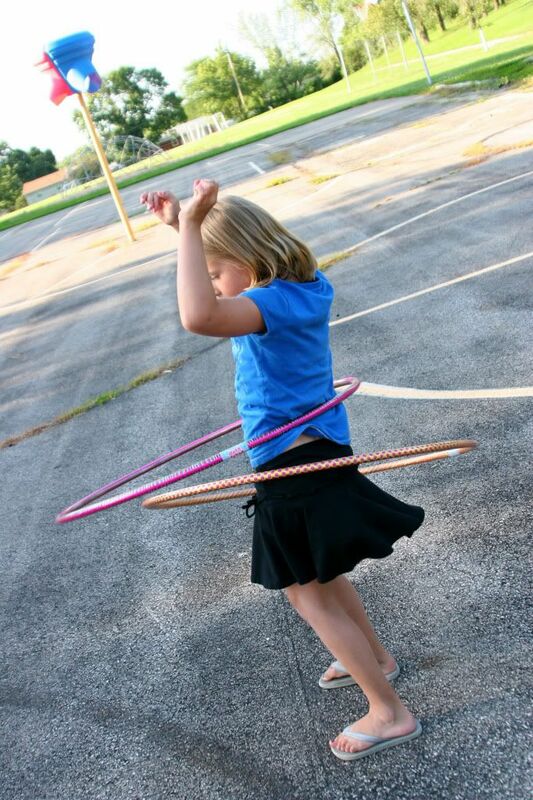 i was an olympic hula hooper as a child- seriously I rocked. not anymore. I need to go and get some for my girls. can't believe I haven't thought about that sooner. Hope summer is good. looks like you are staying busy busy. I miss our weekly emails. time for a catch up I think.